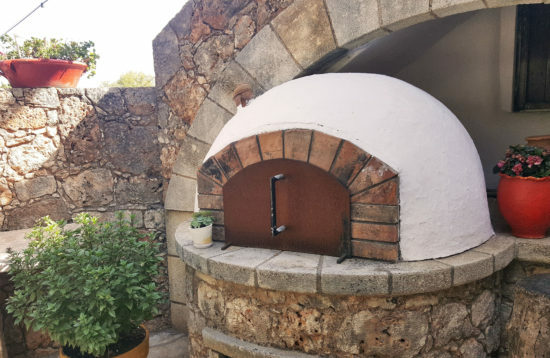 Exploring the Cretan countryside has innumerable highlights. Touring the nature paths can be the most beautiful and extraordinary experience whilst galloping on a friendly, noble creature. Following the ancient inland paths on horseback we discover the most relaxing and serene scenery. We travel along the sandy coastline, find our way up to secluded and forgotten hills and sink into idyllic gorges. The sound of running water, the rustling of the leaves and the birds singing greatly relaxes both your mind and body. Whilst galloping on our horse we experience a unique adventure.  By observing the grandeur of nature we are carried to other eras, riding along the streets which horse riders once rode on and used for trading and commuting. Streets on which aspiring conquerors, wandering nomads and lords of the time also travelled along. The memories of this guided experience on horseback, wandering the vast countryside, will remain forever a special memory and will surely win a place in your heart. 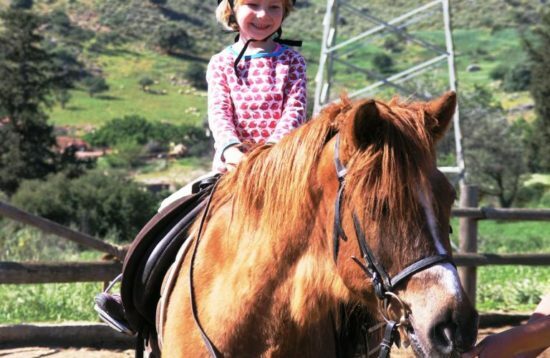 For your best-ever holiday enjoyment, we offer exciting beach rides, beautiful mini-safaris and relaxing day trips as well as easy beginner's walks for non-experienced riders. Green hills, goat-tracks, olive groves, herbs and wild flowers, the unique lake of Kournas, Argiroupoli's waterfalls, many small friendly villages and a superb beach combine to make this the holiday experience of a lifetime! 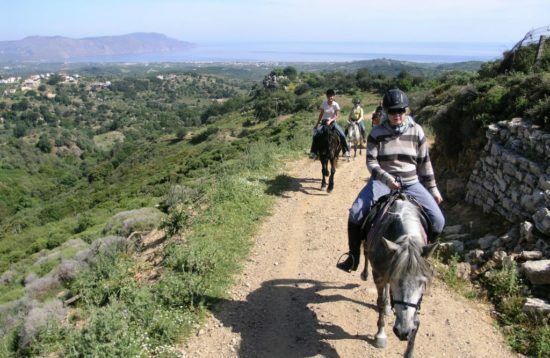 CRETE OFFERS SPLENDID OPPORTUNITIES FOR HORSE-BACK RIDING! 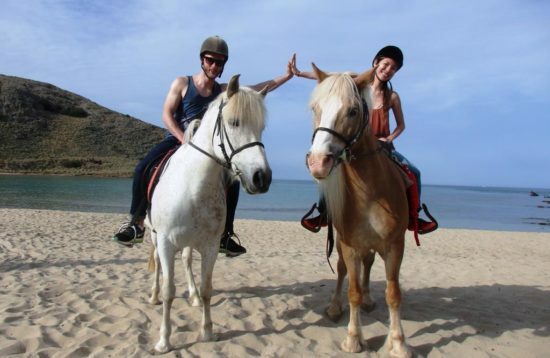 Horse-Riding is located in west coast of Chania, well-known for its long sandy beaches. So be ready for some exciting galloping along the Cretan sea!! And make your dream come true!!! We daily provide early morning and evening rides at 3 different levels: beginners , intermediate and advanced. Other than that we have a special program for children, including guided nature walks. Our guides are German, English, French and Dutch spoken. 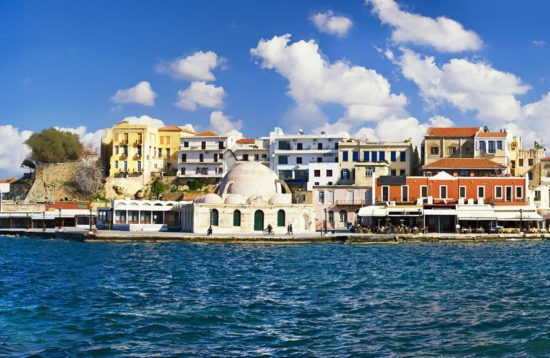 For your information: we arrange transport within the area of Platanias (Chania) and Bali (Rethymnon). For further inquiries and reservations please do not hesitate to contact us. Please choose your riding level HONESTLY as beginners will NOT be accepted on the beach rides! Beach rides are at your own responsibility. For your own safety and comfort, you are kindly requested to wear long trousers and closed toe-shoes. 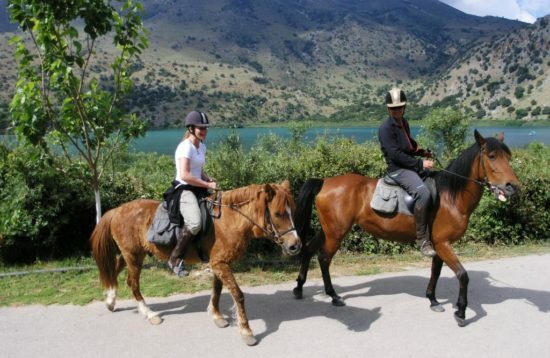 Discover the only freshwater lake in Crete on horseback. The memories of this guided experience on horseback, will remain forever a special memory and will surely win a place in your heart. Subscribe to our newsletter and receive news, updates and tour offers via email.